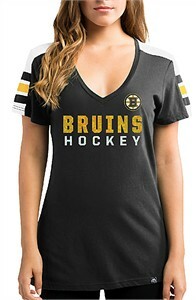 Not your ordinary Hockey Tee for the Girls the Boston Bruins Ladies Goal Cage Tee Shirt from Majestic comes in Black with a white color contrasting yoke with printed sleeve stripes that sets you apart from the run-of-the-mill shirts you usually see on game day. Constructed from 4.58 100% Cotton Jersey material that should give your seasons of wear. This womens top features a deep v neck, short sleeves, a feminine fit body, and a team logo and wordmark screened on the front with clear shatter foil for a little bling.